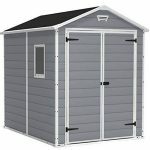 The Suncast Tremont 3 Apex Plastic 8×10 Shed is a shed that has a very smart, classy and modern style to it. If you want a shed that is more than just your standard wooden shed, then this could be the shed for you. 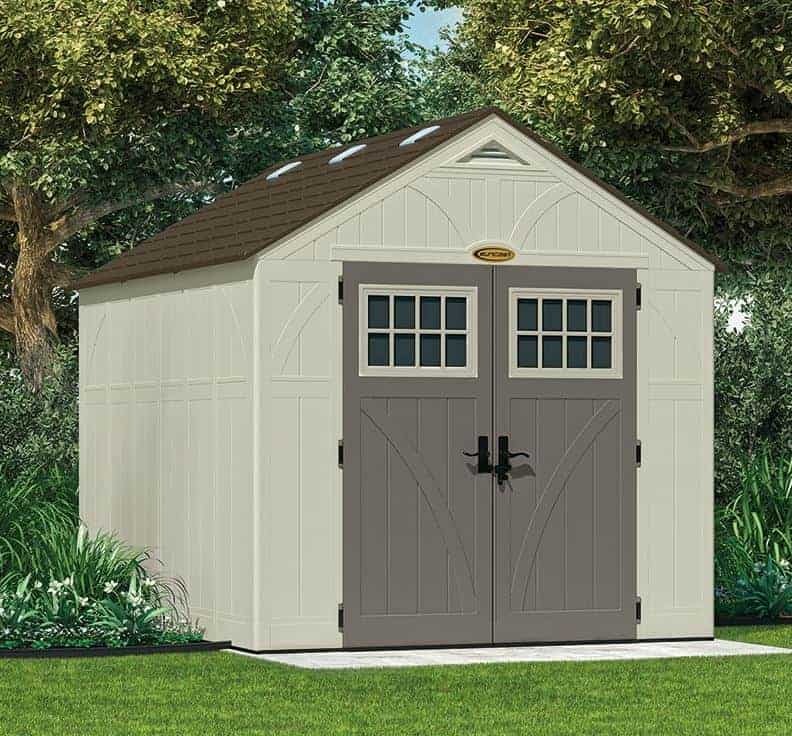 It no doubt is one of the most classy and stylish looking plastic sheds on the market right now. As well as being great to look at, this shed also offers you a lot of room. Inside you have a very generous amount of floor space, but the extra high eaves and headroom mean that walking around inside is a comfortable experience and does not require you to hunch over. Fixed windows, air vents and six skylights make spending time inside this shed very pleasant. This is one of the most top of the line plastic sheds you will ever see. The resin the shed is made from is moulded with blow moulded technology. This is what makes it looks so great, but also what makes it very strong. The shed is reinforced with steel and this is not just the walls, but the roof and the floor as well. So from top to bottom this is one of the strongest plastic sheds you can get. Also, as this is made from blow moulded resin, there is no need for annual treatment. 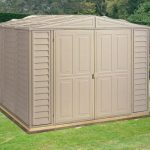 We know that the price of the Suncast Tremont 3 Apex Plastic 8×10 Shed may have you running for the hills, but here at WhatShed we like to cover all kinds of garden sheds such as this extremely high end plastic shed we are looking at today. First of all this shed looks awesome. It has a very modern almost barn kind of style and we think that it will look great in any garden. It is also a very good size, offering 9 feet 9 inches of depth and 7 feet 9 inches of width. This gives you a lot of floor space to make use of. So much that this would work just as well as a workshop as it would a shed. The headroom is also very generous. The eaves are 6 feet high which is a few inches more than the standard height. Along the ridge the shed stands at a very impressive 8 feet 7 inches, so it will be very comfortable moving around in here. Like the rest of the shed the roof is made with a high quality and robust kind of resin. This roof has also been reinforced with a very strong metal. Instead of going for just a plain look, they have moulded the roof panels so that they look like a slate roof. We think this was a great design choice and helps make the shed look very high quality. The roof also have air vents and six skylights, so you get a good amount of fresh air and sunlight in the shed. The Suncast Tremont 3 Apex Plastic 8×10 Shed is made with a technology called blow moulding. This is what allows them to mould the resin into shape and also give the walls such a great design. It also means that the walls are nice and thick so they will have a very solid feel to them. The walls of the shed are reinforced with steel which pretty much serves as the frame. There is not what you would class as a traditional frame inside this shed, but in all honesty we are actually fine with that. 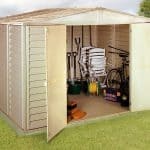 The way the wall panels slot together and the fact they are reinforced with steel makes the shed incredibly strong, so a regular frame would really just eat into your storage space. 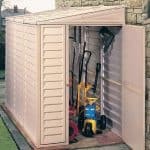 We have seen many plastic sheds that do not come with a floor, but this is one of the most high end sheds from Suncast so not only does it come with a floor, it comes with a heavy duty reinforced floor. This is one seriously strong floor that can take the weight of anything you can think of. Heavy tools, work benches, gym equipment, huge toys the kids promised they would play with but never did, will all be able to be dumped in here and have no effect on the floor at all. One of the best things about Suncast sheds is the way they are so low maintenance. The Suncast Tremont 3 Apex Plastic 8×10 Shed is no different as once it is installed it requires no treatment at all. The only thing that you may want to do is give it a good scrub with a sponge or even just a blast with the garden hose if it gets a little dirty. This shed is protected by a five year anti rot guarantee. This is ok, but we have seen some cheaper Suncast sheds come with a ten year guarantee. We love the design of the doors on this shed. We feel that the grey goes very well with the cream of the rest of the shed. 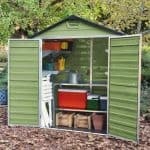 As well as being a stand out feature of the Suncast Tremont 3 Apex Plastic 8×10 Shed, the doors are also very practical. With both doors open you have 6 feet of height and 5 feet of width to get things in and out. Even something like a ride on mower would get through these doors nice and easy. Those large double doors are finished off perfectly with a series of fixed windows. These along with the skylight will let in plenty of natural light. Actually now that we think about it, having windows on a Suncast shed is actually very rare. But we must say, we really like the way it looks and think having them on here was a great design choice. There is not an actual lock included with this shed, but the double door handles do have a convenient space for a padlock. In all honesty this is the only thing we wish they would have changed. At this price range, we really do feel that they could have added a proper lock or at the very least thrown in a padlock. This is actually a very private shed. There may be windows on the doors, but it is still not going to be easy for people to have a nose inside and see what you have. We love the way that Suncast sheds offer privacy, but as they have skylights they are always nice and bright inside. Like all the other Suncast sheds we have looked at, this one does not offer any customisation options at all. This is not a bad thing as the colours they have selected we feel will go in any style of garden. No extras at all are offered with this shed. The only thing you might want to think about is a padlock so you can lock the shed up at night. One really cool thing about this shed is that it actually comes with some corner shelving. Most other sheds will make you pay extra for this, but they are included with the shed as standard here so that was good to see. To score this any lower would be us doing so just for the sake of it. Suncast always make high quality products, but this one here may be the very best work they have done! You are going to get a lifetime of use out of this shed, we are sure of that. This is very high quality and long lasting resin that is reinforced with steel so it is every bit as strong as it is good looking. 10 X 8 is a good size for a shed, but when you add in the extra headroom you get with this thanks to the higher eaves, then that makes this one of the more spacious 8 X 10 sheds out there. Suncast sheds are always pretty easy to install. This one though may be a little trickier as it is so high. Just make sure the person helping you is semi skilled at DIY and not uptight when it comes to making the coffee. This is one of if not the most high end plastic shed we have seen in quite some time. With that comes a price tag that is over a thousand pounds! Final Thoughts: The Suncast Tremont 3 Apex Plastic 8x10 Shed really is one of the most incredible plastic sheds on the market right now. 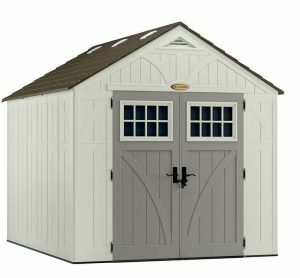 It has an amazing look and is one of the strongest and most long lasting plastic sheds you will ever see. It offers you all the storage space you could ever need and it is designed so that it is a place that is comfortable to spend time in. In all this shed really is amazing. With that though comes one of the highest price tags we have seen on a 8 X 10 shed. 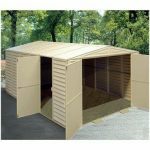 However, if price is not something that you are concerned with or if you are willing to save up to get the best shed, then we are certain you will be very happy with this model.